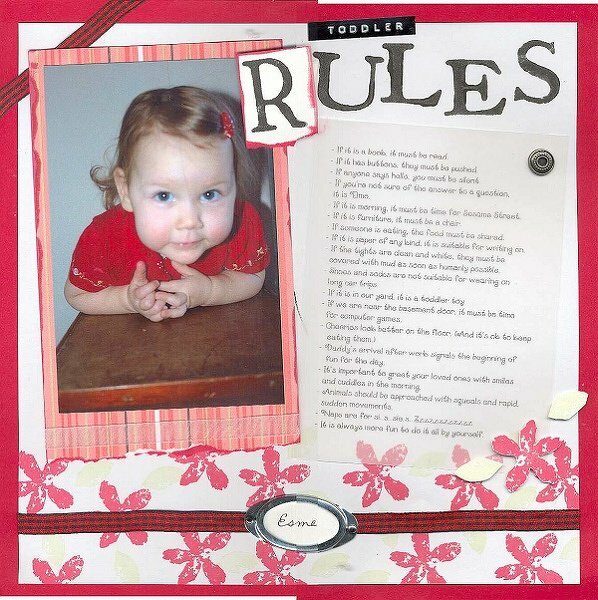 I took the idea for this page from Melissa Chapman's â€œToddler's Creedâ€� layout in the PK Power book, and the layout idea from Cathy Blackstone's 3/14 layout on the calendar. Journaling reads: - If it is a book, it must be read.- If it has buttons, they must be pushed.- If anyone says hello, you must be silent.- If youâ€™re not sure of the answer to a question, it is Elmo.- If it is morning, it must be time for Sesame Street.- If it is furniture, it must be a chair.- If someone is eating, the food must be shared.- If it is paper of any kind, it is suitable for writing on.- If the tights are clean and white, they must be covered with mud as soon as humanly possible.- Shoes and socks are not suitable for wearing on long car trips.- If it is in our yard, it is a toddler toy- If we are near the basement door, it must be time for computer games.- Cheerios look better on the floor. (And itâ€™s ok to keep eating them. )- Daddyâ€™s arrival after work signals the beginning of fun for the day.- Itâ€™s important to greet your loved ones with smiles and cuddles in the morning.- Animals should be approached with squeals and rapid, sudden movements.- Naps are for si..s..sie.s..Zzzzzzzzzzzz- It is always more fun to do it all by yourself. Thanks for looking!